A. Andrew Hauk, a controversial federal judge and shaker and mover in the early days of organized skiing in California, has died at the age of 91. Hauk, who was educated at Regis College in Massachusetts and studied law at Catholic University of America in Washington, D.C., and at Yale, was a private attorney in Los Angeles before being named in 1964 to the Los Angeles County Superior Court by Governor Pat Brown. 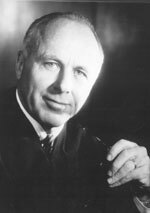 Two years later, President Lyndon Johnson named him a U.S. District Judge for the Central District of California sitting in Los Angeles. Hauk retired from active service in 1982 but continued to hear some cases until his death. Andrew Hauk learned to ski in 1924 in Denver, CO, when he was twelve years old. A fine alpine ski racer for many years, he was National Senior Giant Slalom Champion in 1952. When Hauk moved to Los Angeles in 1939, he found some southern California ski clubs that were very active and competitive. Hauk joined the San Gorgonio Ski Club, remaining in the club as an officer and member until 1950. From this group came a nucleus of twenty skiers who built the original Kratka Ridge Ski Area, installing two rope tows and subsequently adding a chairlift. Starting from scratch, Hauk and his friends had little to go on except their own exposure to ski areas and the enthusiasm to fill a void in the Southern California skiing scene. In 1940, the San Gorgonio Ski Club joined the California Ski Association with the expressed belief that an organization of united skiers could provide the impetus for the development of additional territory for skiing. It was a move that for Hauk would mean 20 years of the highest service to skisport and his emergence as a leading proponent of ski area development. In 1945-46, Hauk served as chairman of the California Ski Association's area development committee, giving him a glimpse of the problems encountered in trying to develop new ski areas. In 1946, Hauk became a stockholder in Snow Valley and was active in its development and growth. Hauk's first major battle in ski development conflicts arose in 1947 when he authored testimony and spoke at public hearings pertaining to the development of San Gorgonio. Despite the efforts of Hauk and other dedicated skiers on behalf of San Gorgonio, the U.S. Forest Service put the project into abeyance in 1949. The stalemate simmered below the surface until 1964 when Hauk and others formed San Gorgonio Ski Lifts. Inc. in which he was vice president and a shareholder. They again began the rounds of public hearings and debate. That the battle lasted for five more years as testimony and arguments for development was prepared and presented by Hauk and others. In 1969, the hearings came to an end when San Gorgonio was declared a Wilderness Area. In 1946, Hauk, along with Cortlandt T. Hill, J. Stanley Mullin, and Fay Lawrence, began to explore the magnificent skiing potential of Mineral King, which had been surveyed by air. The Mineral King Development Company was formed with Hauk as a shareholder and vice president, and snow surveys were conducted over the next two years, confirming their estimation of the area's potential. In subsequent years, they prepared plans for development, but it eventually became apparent that the area would require a larger development than their small company was capable of. In 1955, their findings and plans were turned over to Walt Disney, who. in 1965 was to be awarded a permit by the Forest Service for development of the area. From 1947 to 1949, he was vice president of the California Ski Association's Southern District (now known as the Los Angeles Council) and became involved in the southern area planning committee. Hauk was vice president of the Far West Ski Association from 1947 to 1949, and was a member of the constitution and by-laws committee in 1948 and 1949. In 1947, Hauk joined Southern Skis Ski Club and served as the club's president from 1952 to 1954. In 1952, Hauk became a member of the National Ski Patrol and became involved in Mt. Baldy. He served as vice president and general counsel for the fledgling area, a position he maintained until 1970. Even before Mt. Baldy was developed, Hauk and his friends prepared yearly snowfall reports, conducted feasibility studies, analyzed terrain to determine lift placement, and prepared a master plan. 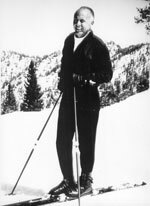 In 1955, Hauk was appointed to the California Olympic Commission for the 1960 Olympic Winter Games at Squaw Valley. Andrew Hauk served as Vice Chairman of the California Olympic Commission which supervised the spending of $8,990,000 appropriated by the State of California for acquiring and constructing all of the major facilities required for the staging of the games. After the 1960 Winter Olympics, Hauk began another phase of his ski career-race official. He often served as chief of course, race committee chairman, gatekeeper, timer, and referee. At the age of sixty-two, after more than fifty years of service and dedication to the sport of skiing, Hauk was inducted into the U.S. National Ski Hall of Fame in 1975. "Skiing is like being a judge," Hauk told the Los Angeles Daily Journal in 1980. "You make quick decisions, and if you're wrong, they're brought up fast." Hauk was born December 29, 1912 in Denver. He died November 9, 2004 in Pasadena. He is survived by his daughter, Susan, of Pasadena, and a brother, Paul, of Colorado.